Patsy has organized our December Paint Out at White Oak River Campground set for December 14th... Thanks Patsy! WHAT: OOPS December "Paint Out"
WHERE: White Oak River Campground... Located on the White Oak River on HWY 17, one mile south of Maysville, North Carolina. WHY: Plein Air Painting... we're addicted and a 'lil bit crazy... BBBBRRRRRRRRRR! Our own OOPS artist, Pat Boni is offering a FREE workshop for all OOPS members. The workshop date has not be set yet (a Sunday) but will be in February 2009 at the Council for the Arts. The workshop will be an intro to watercolors and linear perspective. Even though many of us don't work in watercolors the linear perspective is a must for the plein air artists. More details in 2009. PS... Pat gave demos and talked about art as a career to most of Onslow County's 5th graders at the recent Career Day at the American Legion Building. What a beautiful day we had to paint last Sunday at our November Paint Out at the beach at Camp Lejeune Marine Corps Base. We didn't even have to worry about our safety... after all we were protected by America's finest! OOPS members present: LtoR: Mitchell, Bernie, Dean, Pat, Kathi, and Stephen. Patsy was present but was a bit under the weather and left before we took the group photo. Olivia also joined in on the fun... she took this photo. She is pictured below with the group. Patsy and Kathi look on as Stephen finds a spot out of the wind. A special thanks to Pat who organized the Paint Out.... THANKS Pat! Mitchell settles in for a good spot out of the wind. Glad to have Kathi back after a few months. Dean painting away... he is celebrating one year of oil painting this month! Look at that smile... you'd never know Patsy was sick at the time. Patsy has organized our December Paint Out at White Oak River Camp Ground set for December 14th... details coming soon! Olivia gathered a bunch of rocks and shells and painted on them! See everyone on December 14th! OOPS artists, Mitchell Morton and Bernie Rosage Jr., will be highlighted in "Plein Air Paintings of New Bern" art show presented by and at New Bern ArtWorks Gallery. 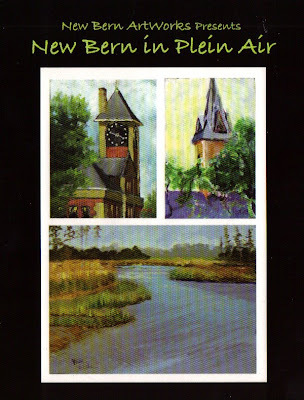 New Bern ArtWorks Gallery presents "Plein Air Paintings of New Bern" and invites you to join Mitchell, Bernie, and the other artists for an opening reception Friday, November 14, 5-8 PM during the New Bern Art Walk. The gallery is located at 323B Middle Street in New Bern. The exhibit will be on display from mid November through December. "City Hall Clock Tower" by Bernie Rosage Jr.
Michael, Andrea, and Kevin (art instructors at Coastal Carolina Community College) announce the winners of the CCCC Juried Art Show. The juried entries and winning works will be on exhibit in the Fine Arts Building at the college through the next week and a half. Our own Mitchell Morton and Stephen Greer take top honors. LtoR... Penny Morton, Mitchell, Stephen, and Donna Graham. Mitchell won "Best of Show" with this painting. Stephen won second place with this portrait of Donna. Mitchell and Donna posing with one of Mitchell's paintings. Stephen's other work was a self portrait. Mitchell posing with another one of his paintings juried into the show. Christian, Olivia, Savannah, and Bernie were there to show their support... and eat the snacks! Congratulations Mitchell and Stephen.... keep up the GREAT work! ~ paint the Sylvester Estate on Comfort Hwy in R'lands area. ~ Palo Alto Plantation on Belgrade/Swansboro Road. There was a great article by Aniesa Holmes in the Neighbors section of the Daily News yesterday (Nov 2) about the Surf City Art Guild with a special interview of Ellen Elder.